If you’re gfree, substitute the whole wheat pasta with quinoa or corn pasta. Fill a large stockpot with water and bring to a boil. Cook the pasta according to the package instructions. Drain and set aside. Heat a large skillet with the olive oil over medium heat. When the oil is hot, add the garlic and cook 1 to 2 minutes, stirring often until the garlic is golden. Add the flour, reduce the heat to medium. Cook 1 to 2 minutes stirring constantly until mixture resembles a thick paste. Whisk in the milk and cook 3 to 4 minutes until the mixture begins to thicken. Stir in both cheeses, salt, garlic powder, paprika, and pepper. Mix until cheese is smooth and melted. Stir in the macaroni and chicken. Serve immediately. Nutritional Stats Per Serving (2 cups): 440 calories, 28 g protein, 43 g carbohydrates, 15 g fat (7 g saturated), 58 mg cholesterol, 8 g fiber, 436 mg sodium. 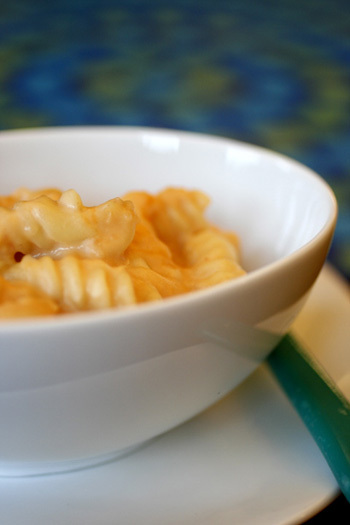 What a delicious recipe for mac and cheese. I like the idea of serving it with buttermilk chicken fingers. Yum!! !